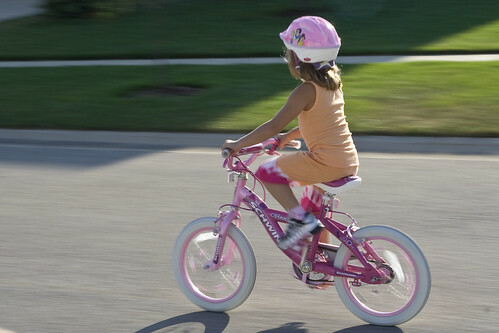 The kids were our riding their bikes, so I got some panning practice. Lily has just learned to ride without her training wheels. This is a big deal for her, and she’s very proud. Lily with no training wheels. 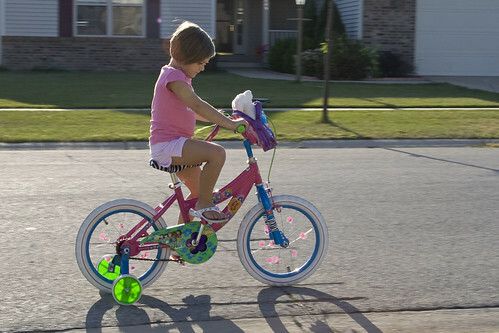 We let Lucy try without the training wheels, but it didn’t go so well. Perhaps next summer. The photosphere is all a twitter (well, maybe the Canon photosphere) with the official announcement of the 50D. I was very close to buying a 40D. Now I’m not sure if I should wait or just get the 40D. It’s not like I get a new camera everyday, so I’d want all the noise capability I can get.